This is 13 Helpful Tips on Making an Acoustic Guitar Bridge. The bridge is a very important part of your acoustic guitar. Making a bridge is easier than it looks, especially if you follow these tips. I also reveal my entire bridge making process in two videos near the end of the post. Enjoy! A lot of beginner guitar makers buy their bridges at first. This is ok if you are not experienced at all, or if you want to speed up the process. Store bought bridges are easy to come by, and they are not expensive. If you build your guitar to common specs, you will be fine with the height as well in most cases. However, if you are going through the process of making an acoustic guitar, it’s worth the time to make the bridge too. It’s not a terribly complicated process, and you can make a custom bridge to match your custom guitar. Follow these tips, and you will have a much easier time making your bridge. It all starts out with the wood that you choose. The beauty of an acoustic guitar bridge is that you can make it from nearly any species. However, you do want to stick with types of wood that have a track record of success on a guitar. For example, the two most commonly used types of wood for bridges are East Indian Rosewood and Ebony. Both are used by nearly all manufacturers, and they are the classic bridge look that you are familiar with. Of all of the following options, the Martin style Rosewood bridge is an icon, and you can never go wrong with a classic. The good thing about these wood species is that they are tried and tested. Dense woods have been used in instrument making for hundreds of years, and both of these in particular have been very good. You can’t go wrong with a good track record. On the other hand, as long as you choose a wood that is similar in properties, you can also do fine with other types. For example, Bocote, Goncalo Alves, Bubinga, and Cocobolo will all make good bridges. These woods are similar to the main two species used for bridges, but you can get a less common look with similar performance. If you are making a custom guitar, picking out your bridge species is a fun aspect of the build. Another tip that will help you in the event that you need more than one blank is to cut several at one time. When you buy a piece of wood for a bridge, it will be a little more expensive. In general, the denser and more exotic woods are more expensive. A way to conserve money on the purchase is to get a piece that you can harvest several blanks from. Plan your sawing, and at the time you cut out your blank, just cut out several from that same piece of wood. The nice thing that having more blanks does is it lets you make a mistake. If you ruin a bridge, all you need to do is grab another blank from the pile and start over. When you ruin the only bridge blank you have, you need to go to the store, and that can be a pain. You will also have a lot of bridge replacements available whenever you need them. One of the most common errors in making acoustic guitar bridges is that you over shoot or under shoot the bridge height. While making a bridge that is too tall is an easy fix, a bridge that is too short is much harder to bounce back from. For the player, string height is important. The bridge and saddle have a big effect on that experience. A tall bridge is a fairly easy fix, all you do is plane it down, and replace the holes and slot. If the bridge is too short, a tall saddle can bend or flex, and make the bridge unusable. Either of these issues can cause the guitar to not play very well. The best way to plan the height of the bridge is using the exact guitar. Every guitar you make will be a little bit different. Even the small differences can be worked out in the planning stages, and all you need to do is measure the bridge to the specific guitar. Use a straight edge that is long enough to go across the frets and project over where the bridge area will be. This is how you plan you bridge height. The area under the straight edge over where the bridge will be in where you take your measurements. Pay attention to the book that you are working with, as there are a few different ways of plotting the height. As long as you take a measurement, and make sure that the bridge makes sense on the exact guitar it will live on, you are doing the right thing. No matter how tall or short your bridge, one thing that is universally accepted is that you need to slot your saddle close to the bottom of the bridge. You can determine this closeness yourself, but about 1/16+ to a little less than 1/8 inch is a good area to be in. The deeper the slot, the more the bridge wood will hold onto the saddle. The more hold, the more support, and the saddle will function well. Taller saddles that stick too far out of the slot run the risk of breaking under tension, which is not good. When you route or carve the slot, make shallow passes. Don’t be concerned about carving out and removing all the waste material in the first round. Take your time, and be sure not to overly widen the walls of the slot. When you reach your target depth, you are done. One of the easiest ways to make the saddle slow in your acoustic guitar bridge is to use a Dremel or a Router. Make a jig, and then the process becomes really quick. All you need to know are a couple things, and you can make the jig yourself. The saddle slotting jig is just a holder for the blank, with an angled fence. The angle on the fence matches the angle of the saddle, and that’s about it. Everything else is details, and as long as the jig does the job then you made it right. The bridge blanks are all going to be a little different, so make sure that you can adjust the jig from time to time. If you would rather make a solid jig, then plan your bridge blank sizes and you will need one for each. The pin holes have to all be in the right place, or the look will be off. Since all the pins are right next to each other, the slightest difference can be seen from space. Thankfully, there are ways to fix that before you make a mistake. The easiest is to use a bridge pin drilling jig. You can buy one of these from a guitar making parts supplier, or you can make it yourself. Being that it’s just a piece of wood with six holes in a row, I recommend making it yourself. Literally, you only have to get it right one time and then you can use the template to drill your holes from then on. Take the time to carefully plot out the holes, and then one at a time make the drill holes. If you have to make a couple of these, it’s ok. Keep going until you have it. 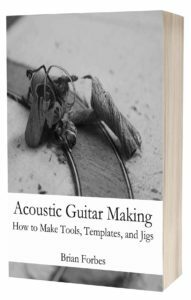 Above all of these tips, this is the biggest one for making an acoustic guitar bridge. If you are brand new to making guitars, do yourself a favor and do the hardest parts of the bridge first. If you do, you will be rewarded with more good bridges in the end. For example, if you are having a hard time routing the saddle slot, don’t waste time carving the bridge to perfection before slotting the slot. What happens if you make a bad slot on a perfectly carved bridge? It goes into the trash. The same thing happens to a bridge blank that you route a poor slot on step one. It goes into the trash as well, but there was a lot less time and effort wasted. Get through the hardest parts of the bridge making process, slotting and drilling, and then go on to carving. If the process is easier for you to do it in a different order, feel free. Over time, you will know what you like to do and what you don’t. Any way you do it, do the hardest parts first, and you will never have to throw away a fully made bridge right near the end of the process. Completely carving an acoustic guitar bridge can be a challenge. If you are new to using a chisel, the task can look bigger than it really is. Instead, saw away the bulk of the waste to make the project more manageable. The easiest saw for this is a band saw. Saw off the excess on top of the wings, and the whole operation will only take seconds. In that short amount of time, you remove enough wood for several minutes or more of chiseling. You can also do the rough shaping of the bridge profile too. Simply mark out the shape, and then follow the marks with the band saw. Stay just outside the lines, which will give you enough extra to sand and remove the tool marks from the saw. After roughing out is carving and refining the shape. The saw can only do so much, and it’s more like swinging a club than doing any fine knife work. This is where chisels and files really shine, and will further refine the shape. Start with the chisel if you are comfortable. There is nothing like a really sharp chisel to remove wood, especially an oily wood like Rosewood. Use the chisel, and when it comes time to round things, switch to the file. A medium file is perfect for rounding over the sharp edges, and making the shape really smooth looking. The file does a great job at removing a lot of material quickly, and not leaving behind marks that are too tough to remove afterwards. Once you are done with the chisels and the files, it’s time to sand. Start with an aggressive grit like 100, and power through the scratches and marks. Once you get the bulk of the marks removed, you can then switch to a finer grit. Don’t switch too fast, because the finer the grit, the harder it is to remove material with. Stick around on the same grit until the surface is no longer being improved. After that, switch to the next finest grit and go again. Sand the surface down to 400 grit, and leave no scratches behind. This is a perfect grit for bridges, because it is smooth, but not overly smooth. If you plan on buffing, this is a good starter grit. If you plan on finishing, you can be assured that the surface will be great. You can also finish with 0000 steel wool if you don’t plan on buffing. It will take a little time, buy you can get a polished look with steel wool. A lot of guitar makers buff their bridges. This is the ultimate in shine and smoothness. A well buffed piece of wood is the smoothest surface you will ever touch. It’s hard to believe you can get a piece of wood that smooth, but you can. The easiest way to get into buffing is to get the Beall Buffing System. This is a three buff system that starts with a Tripoli compound, then a White Diamond compound, and finally a buffing of Carnauba wax. The setup comes for use on the lathe, and it also comes where it can be attached to a small electric motor. 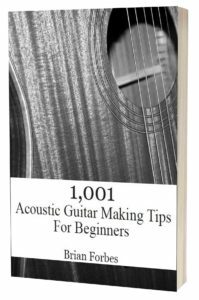 Either way you go, buffing an acoustic guitar bridge is an easy process, and you will love using the system on a lot of other things. Clamping the bridge to the top of the guitar can be a little bit of a challenge. The clamps have to have a really deep reach, and you need to make it really secure. There is a lot riding on this little joint, so you need to get it right. The easiest way to do this is with a set of thin bolts, and some plastic washers. All you need to do is drill through the high and low E bridge pin holes on the bridge. Make sure to go all the way through the bridge plate. Then, bolt the bridge in place with the plastic washers on top to prevent scratching the bridge. When you use a couple bolts, the pressure holds the bridge in place, and you get all the benefits of clamping, but with bolts. Drill the holes at 3/16 inch and buy bolts of the same diameter. They will help locate and secure the bridge until the glue dries. As the glue is drying on your bridge, it’s important to leave that joint to dry overnight. The bridge to top joint is a very important joint. It sets the scale length, and helps hold the top tightly while the strings are played. Since this joint is carrying so much on it’s shoulders, leave the glue to dry for several hours or better overnight. Some glues say that they can be used in a shorter time than that, but be cautious, and don’t rush things. In the end taking off the clamps or removing the bolts is not going to make things really go that much faster. You still have more work to do, and you still need to finish the guitar in many cases. Instead of rushing, let the joint dry overnight and your bridge will be more secure. This is a two part video series where I break down the steps you need to take in order to make an excellent bridge. Watch the videos from beginning to end, and I promise that you will be happy with the knowledge you gain. 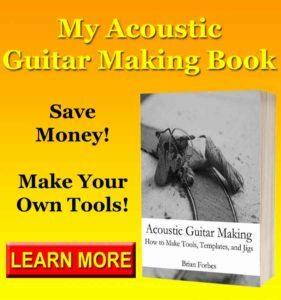 Save Money and Make Your Own Guitar Making Tools and Jigs! Available Now on Amazon! Your homework is to start making your own bridges. It’s actually an easier task than most people think it is, and you can make a good looking bridge on the first try. Start with a good template, and make a design. After that, start carving. Use a saw to remove the excess, and then refine the shape with your other tools. Spend some time making your bridge, and be mindful in the exercise. This means don’t worry about the bridge fitting the guitar just yet. Get the process down first on your practice run. If you want to be a little more adventurous, pick out a piece of exotic hardwood and make your bridge. Make sure that the selection makes sense, and make sure that the wood has a good track record of being a guitar bridge. Then, use the tips to make a completely custom bridge. Learn Fast by Reading Tips! Available Now on Amazon! Making a bridge is easier than is looks. If you are going to go through the whole process of making a guitar, then you should make the bridge too. After all, the bridge is just another element of a custom instrument. There are a lot of great tips in this post on how to make an acoustic guitar bridge really well, and if you follow them, you will have good results. Don’t worry about the process in the beginning, just start learning and have fun. After a while, you will be able to make a bridge rather quickly, and it will become a part of your normal routine. When this happens, you can then start looking into exotic hardwoods and even binding your bridge. The sky is the limit. You can also design wooden bridges for electric guitars too. They are not as common, but some handmade models still use classic wooden bridges. 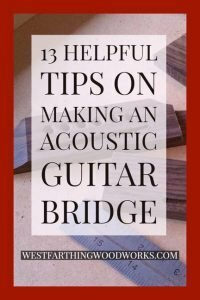 If you have any questions on 13 Helpful Tips on Making an Acoustic Guitar Bridge, please leave a comment and I will be glad to answer them.